This Polar Commando Custom Minifigure by Citizen Brick is the third in the Commando series, the others being Special Operations and Jungle. Each of the minifigures in the series are limited to 500 and are packaged with a hand-numbered collectors card. This military minifigure is quite unique as it comes with winter camouflage, beanie and skis as well as a a white, grey and yellow camouflage printed BrickArms Heavy Assault Carbine. This Polar Commando has a high quality pad print. On the front torso there is a print of a heavy winter coat with a tactical belt and ammo pouches and a grenade, while the back of the torso features a hood, revolver and more pouches. The legs have front and side camouflage printing, while both arms also have printing. This is a really nice custom minifigure and the Polar Commando is available at minifigures.co.uk. The Jungle Commando is by far Citizen Brick’s best custom minifigure to date and features 360 degree pad printing and also comes with a collectors card, and BrickArms machete and combat light machine gun. The front of the minifigure features a very nice jungle camouflage print with tactical belt. The legs have camouflage printing on them as well as knee pads, while the arms have camouflage printing and stripes. The back torso printing features a backpack and water bottle, and the head and bandana are camouflage printed. This Jungle Commando is limited to 500 with each collectors card numbered. So if you want one you will have to be quick! Citizen Brick offer a range of high quality limited custom minifigures. You won’t find stickers that peel off or paint that chips away over time, as they use professional-caliber equipment which are designed to stand the test of time. If you need a heavy metal minifigure to join your LEGO band, or are looking for some slightly more eccentric personalities for your collection, check out the full range of their minifigures. 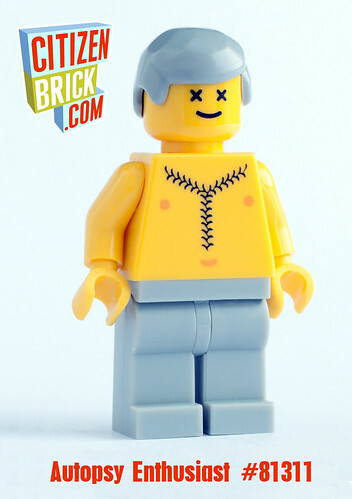 Citizen Brick Leather Enthusiast Minifigure. Citizen Brick Heavy Metal Enthusiast Minifigure. Citizen Brick Motorcycle Enthusiast Minifigure. These custom designs are printed directly onto the minifigure for a perfect high quality finish. These are all available online from your official Citizen Brick reseller. simple yet totally emcapsulates the character with minimal fuss, love it, the crosses for eyes on this custom minifig yet still with smiley mouth says it all for me.